Lonicera maackii.© Les Mehrhoff.www.discoverlife.org. (Accessed 7/2014). Lonicera maackii is a shrub to 5 m tall, from a large woody burl, extensively shallow-rooted but apparently not colonial (Deering and Vankat 1998); older stems hollow, arching, pith brown, stems and buds gray, hairy, new growth green, hairy, winter buds pale brown, wooly; becoming reproductive at about 2.5 m height (about 5 years old). Leaves opposite stalk 0.3-0.5 cm, glandular-hairy; blade elliptic, to 8 cm long, 4 cm wide, paler below, tip long-pointed, base wedge-shaped, veins hairy on both sides of blade, surface densely sprinkled with minute dots (use lens). 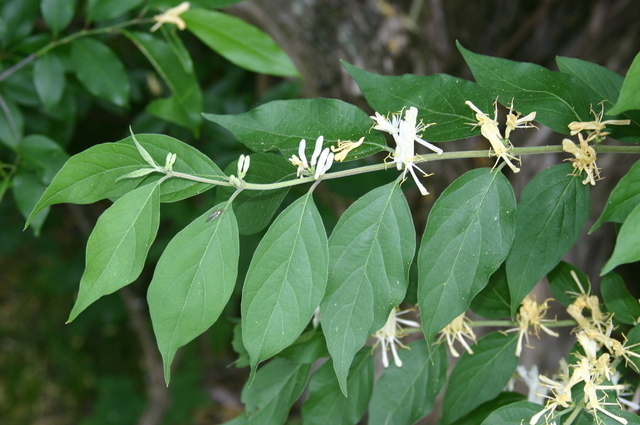 Flowers white, becoming yellow, irregular, to 2 cm, strongly 2-lipped, upper lip 4-lobbed, in pairs in leaf axils on new growth, flower stalks shorter than leaf stalks (Rehder 1986); blooms late April-May, self-incompatible. 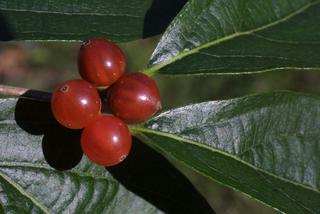 Lonicera maackii, fruit.© Steve Baskauf.www.discoverlife.org (Accessed 7/2014). Fruit orange, becoming dark red, translucent, about 0.6 cm, crowed by remnants of stigma; pulp lipid <10 % (White and Stiles 1992), fruit maturing Oct. Fruit eaten & seeds dispersed by birds, seeds eaten by some small mammals. introduced to N.Y. Botanic Garden. 1896. 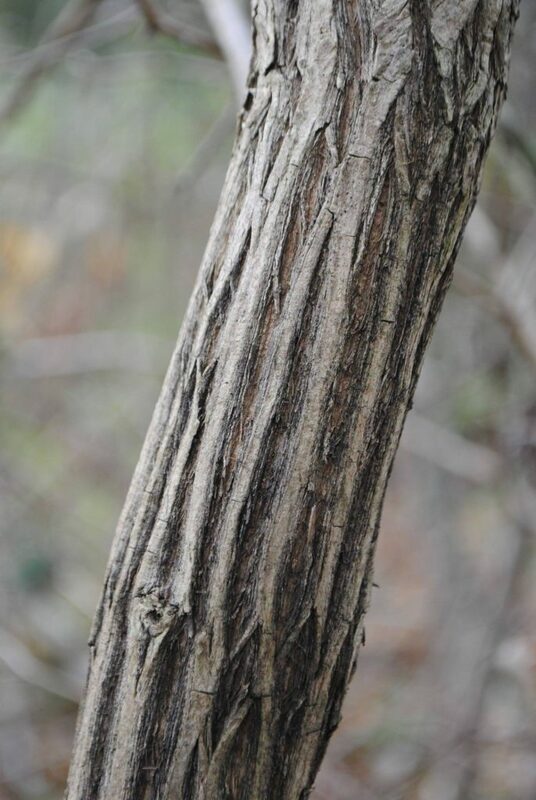 Habitat: disturbed understories of secondary woods, edges. Lonicera maackii invaded woodland understory. Photo by K. Yatskievych.Missouri Botanical Garden.mobot.org (Accessed 6/2015). Notes: Aggressive, excluding native shrubs. Decreases abundance and richness of native species. Leafs out earlier than most native plants and keeps leaves late into fall potentially shading out spring ephemerals (Hutchinson and Vankat 1997). ). It has been shown to inhibit the growth and reproduction of native herbs (Gould and Gorchov 2000). Fairly intolerant of shade. Seeds have no dormancy requirement but seedlings and adults grow poorly in closed canopy forests (Luken & Thieret 1996). Appears to establish best in edges, successional scrub, woodlands and disturbed forests with open canopies (Hutchinson and Vankat 1998). 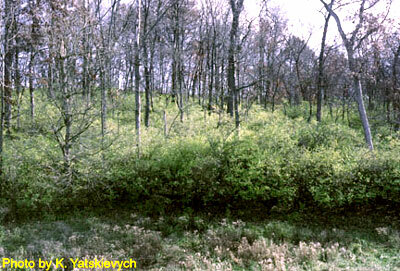 However, it can invade intact forest patches (Medley 1997). “Rem Red” is a cultivar widely distributed by the Soil Conservation Service (now the Natural Resources C. S.) and is listed on the NYS Natural Heritage Program’s Invasive Alien Plant Species list. Infected by Insolibasidium deformans (Basidiomycotina) a blight of honeysuckles that causes yellowing and death of young leaves (Sinclair et al. 1987).